Free Excerpt, Big Discount, and Jokes! 1. 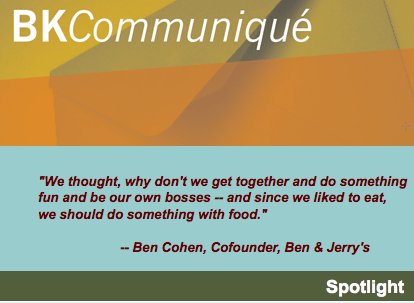 Ice Cream Wasn’t Their First Choice: Ben & Jerry’s founders Ben Cohen and Jerry Greenfield’s original idea was one where they would deliver fresh bagels, cream cheese, lox, and the New York Times to people’s doors. But upon learning how much the equipment would cost, they scrapped the idea. 2. These Guys Weren’t Exactly Experts, Either: Their incredible range of creative flavors suggests that the founders were experts in the field of ice cream-making. They actually knew nothing about making the confection at all and learned everything from a $5 correspondence course. 3. Worse Yet, Ben Has No Sense of Smell: He can also barely taste due to his anosmia, a condition in which a person has a dysfunctional olfactory system. In order to compensate for this condition, Ben has said would add larger and larger chunks of various add-ins in order to satisfy his need for texture. This would eventually go on to play a major role in the formation of Ben & Jerry’s signature ice cream style that incorporates larger chunks. 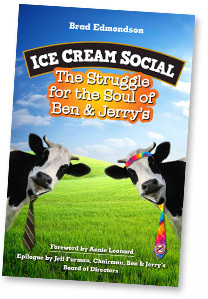 And Jeevan delivers lots more, including several entertaining bits that have nothing to do with Ben & Jerry’s. Read them here.